Winners one day earlier of the Cadet Boys’ Team title at the 2017 El Salvador Junior and Cadet Open, Puerto Rico’s Angel Naranjo and Jabdiel Torres duly booked their places in the second round of proceedings in the Cadet Boys’ Singles event. However, as play progressed on Friday 19th August, the quest to add more medals to the collection proved testing. Angel Naranjo experienced few problems; he beat Chile’s Cristian Carrillo (11-8, 11-5, 11-6), prior to accounting for the El Salvador duo of Edgardo Sanchez (11-6, 12-10, 11-7) and Mateo Martinez (7-11, 11-6, 11-2, 11-12). The result meant a direct entry to the second round; for colleague Jabdiel Torres, who had remained unbeaten throughout the whole of the Cadet Boys’ Team event, it was a different scenario. He accounted for Costa Rica’s Ricardo Azofeifa (11-4, 11-9, 11-4) and El Salvador’s Enzo Leiva (12-10, 11-8, 11-6) but sandwiched in between experienced defeat at the hands of Mexico’s Alberto Lopez (11-5, 8-11, 13-11, 11-9). Alberto Lopez duly remained unbeaten to top the group and hence progressed directly to round two; for Jabdiel Torres an opening round encounter was required, the young man duly responded. He overcame Sweden’s Teodor Siljeholm in three straight games (11-5, 11-9, 11-3). Places in the main draw for Angel Naranjo and Jabdiel Torres on what proved a very fruitful day for Puerto Rico. Gustavo Cruz and Daniel Hernandez also finished in first positions in their respective groups and thus advanced directly to the second round. Likewise, Costa Rica and Guatemala enjoyed success; for the former John Lopez and Alfredo Sanchez secured first places in their respective groups, as for the latter did Sergio Carrillo and Luis Ton. 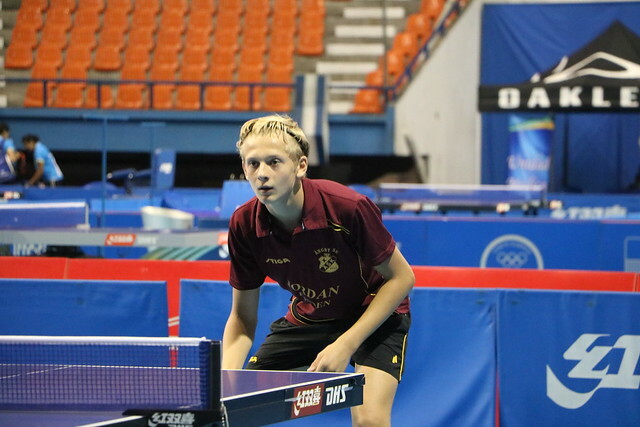 The second round of the Cadet Boys’ Singles event will be played on Saturday 19th August; the quarter-finals, semi-finals and final on Sunday 20th August.